Portents in Paris | Wott's Up With That? “Portents in Paris“ (2015-01-10). Last week Islamic fanatics cold-bloodedly murdered a dozen French journalists at Charlie Hebdo who have mocked extremist Islam, and there’ll be an environmental conference in Paris this year. Therefore environmental activists are just as bad as murderous Islamic fanatics! An idiot’s cartoon proves it! That’s Anthony Watts’ fingers-crossed-behind-his-back idea of respectful honest-broker climate debate I guess. “Freedom of speech” is really just a useful jumble of letters to Anthony, something to whine accusingly while pretending that he doesn’t aggressively impede, censor or block critics on his own little mud-pit of a website. From the crude pen of a crude thinker. 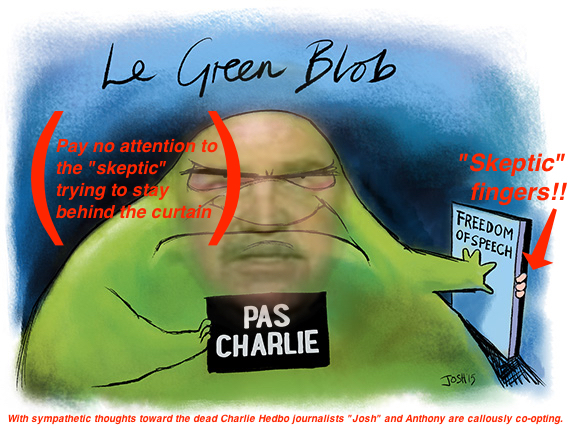 Here’s a tip: “freedom of speech” doesn’t mean that anyone is required to repeat Anthony or his buddies’ statements. And when the things Anthony declares must be heard don’t rise above the level of malicious, dishonest, false and misleading he’s going to have a hard time finding someone who is willing to share them with others. Unless they have the same malicious agenda. This entry was posted in Character Assassination, Whining and tagged Free Speech, Hypocrisy by Ben. Bookmark the permalink. What a sick cartoon. Ashamed. So to these people “Freedom of speech” means feeling justified that fabricating, spreading and clinging to demonstrably malicious lies are part of what should be a reasonable educational dialogue of critical importance to our society’s future – is fine and dandy. But, that translates into “Learning Is Their Enemy” – hmmm, isn’t that exactly what drives todays rabid religious fundamentalism with all it’s atrocities. The hypocrisy and blindness, to say nothing of their ruthless viciousness, is truly mind boggling. PS. Andrew Dessler’s The Alternative Reality of Climate Skepticism at Rice University’s Baker Institute for Public Policy.